Following a far-reaching and intense cost-cutting process, the UK's Ministry of Defence has decided that the current home of the country's premier display team, RAF Scampton is to close. RAF Scampton has a long and illustrious history, along with the Red Arrows, it was also the home base of the famous 617 Squadron as they prepared for the daring Dambusters raid during World War II. During the height of the cold war, Scampton was also home for the Vulcan bombers and their deadly payloads. As the base is to close before the end of 2022, the hunt was on to find a suitable home for the Red Arrows, other than the Cyprus winter training base the team utilise. Now the long list has been reduced to a shortlist of just three bases - RAF Leeming, RAF Waddington and RAF Wittering. Before a base can be decided upon, more in-depth research needs to be conducted, not least one with the UK's Civil Aviation Authority to find, design and allocate a piece of airspace that the Red Arrows could use for display training. So while those and other studies are ongoing, its not possible to know where the team will soon call home. RAF Leeming - This North Yorkshire bases trains, delivers, and supports UK and overseas Expeditionary Air Operations it is the home to a diverse range of squadrons and lodger units including 90 Signals Unit, and a Mountain Rescue Team. With such a broad range of expertise and close proximity to training areas at Spadeadam, Otterburn and Catterick, RAF Leeming is the preferred site for deployed exercises and detachments from UK and overseas units. It has a large array of facilities for personnel including shop, bar, school and there is plenty of airside space for the team. The 100 Squadron is based at RAF Leeming which flies The BAe Hawk T Mk1, the same aircraft the Red Arrows flies. However, these jets are only expected to be in service for the next 10 or 11 years. RAF Wittering - A strong candidate is RAF Wittering which is located in Cambridgeshire and Northamptonshire and is the main operating base and headquarters for the RAF A4 Force and is a major Station for flying training. The A4 Force deploys the vital engineering and logistic support around the globe and there are a number of flight and pilot training operations based here, including, No 16 Squadron, No 6 Flying Training School and No 115 Squadron. Whilst there is currently no jet force based there, it has played home to the Harrier, which arrived back in 1969 and it was an association that lasted for over forty years. The Harriers were involved in almost every major UK conflict including the Falklands, Gulf War Two, the Balkans and Afghanistan. They were finally withdrawn and retired in 2010. Around 1,400 Service, civilian and contractor personnel work at RAF Wittering and there is the space needed for the Red Arrows, although perhaps new offices would be needed. RAF Waddington - This is currently one the RAF’s busiest stations, it is a main hub for the UK Intelligence, Surveillance, Target Acquisition and Reconnaissance (ISTAR) and the main operating base for airborne intelligence aircraft and systems like the E-3D Sentry AEW1. Air ISTAR is the RAF’s eyes and ears in the sky and provides British and NATO military commanders with critical information about what is going on around them. The Air Warfare Centre at RAF Waddington provides rapid and contextual integrated mission support to front line commanders. Approximately 3,500 Service personnel, including those from the civil service and other contractors based at RAF Waddington. This is a busy and active base and therefore space is rather limited, plus the airspace is rather congested at times, which might, therefore, hamper the teams desire for more display training. 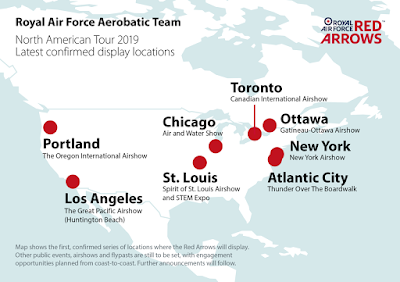 It was also confirmed recently that the Red Arrows will embark on a massive tour of the US and Canada during the summer, with the team displaying at a large number of shows through the summer. 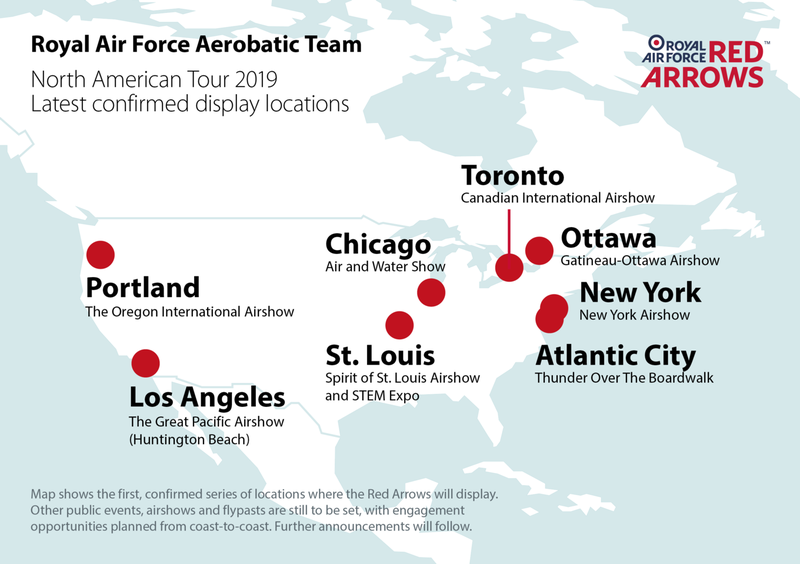 So far here are the confirmed airshows where the team will put on a display. There are other venues, fly-pasts and events that have, as yet, not been confirmed but will be added to the schedule in due course. 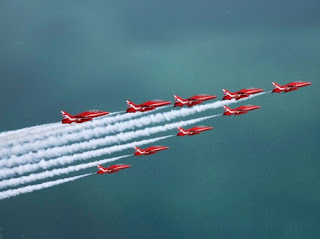 The Red Arrows are renowned as one of the world’s premier aerobatic display teams, having performed almost 5,000 times in 57 countries since 1965. UK International Trade Secretary Dr Liam Fox told us, "The Red Arrows have a rich tradition of working with the GREAT Britain Campaign and DIT to promote trade, investment, tourism and education, all while presenting a positive impression of the UK. Their tour of North America will provide an invaluable opportunity to deepen the partnership with some of our closest allies and trading partners." "It will include an integrated programme of trade missions and business engagement, involving both the display team and ground crew, and build on the experience of previous tours to provide even stronger support for our business objectives." Squadron Leader Martin Pert, Red 1 and Team Leader of the Royal Air Force Aerobatic Team, said, "Confirming this initial group of display locations where we will perform in North America is not just exciting for those people hoping to attend these events – but also for the whole Red Arrows team as well."